[Firaga Armor] – X.Borg is coming to advanced server as a free hero (Limited). Unavailable for purchasing. Skill 1 – Fire Missles: X. Borg activates the flamethrower and fires in the chosen direction, dealing Damage continuously. Enemies whose tempeture rises to the limit will take True Damage. Armorless State: X.Borg adjusts the flamethrower to narrow the gunfire coverage and extend the shooting range, reducing the damage of that in Armor State. Skill 2 – Fire Stake: X. Borg shoots 5 Fire Stakes at the edge of the fan-shaped, indicator. Several seconds later, the stakes are taken back into his body. Each stake deals Damage to enemies in the path and pulls them back. If the Fire Stake touches the Firaga supplies in its path, the supplies will be taken back as well. Armorless State: X.Borg adjusts the Fire Stake Launcher to send the stakes farther away and shortens the gap between the stakes. Ultimate – Last Insanity: X. Borg starts the self-destruct program, spins around frantically and shoots fire around to deal Damage. This stage lasts several seconds. Then he self-explodes to cause True Damage. The enemy closer to the explosion center will take more damage. The explosion destroys the current Firaga Armor and puts himself under Armorless State, where this skill cannot be used. Use again to end the flame spray and self-destruct right away. Passive – Firaga Armor: X. Borg is equipped with a homemade Firaga Armor that inherits part of his own Max HP, taking all damage for X. Borg while it’s active. A short circuit will take place when the armor runs out of HP, and X.Borg will do a roll to the direction of the Joystick to disengage from the armor. In this meantime, X.Borg won’t take any damage. He then continues to restore energy in Armorless State. When energy is full, X.Borg will re-equip the armor and restore a part of the armor’s Max HP. X. Borg’s fire damage causes enemies to warm up, and enemies with the highest temperature will drop Firaga supplies when they take flame damage. Pick up, supplies and restore Armor, or restore energy while in Armorless State. 1. [Granger] New Skin – [Bardic Whisper]. Diamond 269. Launch week 30% diamonds OFF. Available from 00:00, April 23rd (Server Time). [Granger] and his new Skin – [Bardic Whisper] will be in a bundle. Launch week, 30% Diamonds OFF. available from April 23rd (Server Time). 2. [Angela] New Skin – [V.E.N.O.M. Vespid] Diamond 899. Launch week 30% Diamonds OFF. Available from April 16th (Server Time). V.E.N.O.M. Team is coming! [Angela] and her new Skin – [V.E.N.O.M. Vespid] will be in a bundle. Launch week, 30% Diamonds OFF. Available from April 16th (Server Time). 3. [Minotaur] Zodiac Skin – [Taurus] obtain it in Event [Zodiac Summon]. 4. [Clint] and his skin [Sun ‘n Sand] has been revamped! 5. [Karina] and her skin [Phantom Blade] has been revamped! A. Premium Skin Fragment Shop: [Alpha] – Sea Gladiator Available from April 21st. B. Rare Skin Fragment Shop: [Karrie] – Dragon Queen Available from April 26th. Trouble Maker: Adjusted the duration of damage dealing to 2s from 1s. Ionic Edge: Adjusted Damage increased of each stack to 35% from 25%. Now, can increase at most 280%, instead from 200%. Consecration: Added Effect – Restores 200/300/400 HP for himself after use. Consecration: Adjusted Shield and HP Regen effect improved to 50%/50%/50% from 60%/70%/80%. Young Again: Fixed a bug where this skill can’t be released after respawn. Stardust Dance: Adjusted Cooldown to 5.5/5.1/4.714.3/3.9/3.5 from 7/6.3/5.6/4.9/4.2/3.5. Adjusted Growth Physical Defense to 3.3 from 3.8. Maximum Charge: Adjusted Cooldown to 24/20/16 from 20/18/16. Contract: Soul Steal: Adjusted the increased damage from each stack of Contract: Life Steal to 8 from 7 & Optimized the display effects of his skills. Optimized the display effects of his skills. Pursuit: Optimized the display effects of his skills. Revenge Strike: Adjusted Equipment Attack Bonus to 0.8 from 1.2. Added extra Physical Damage equal to 8% of the enemy’s lost HP after using this skill again. Execution Strike: Now you can use Joystick to adjust the position while swinging the hammer. Chaotic Barrier: Lost HP increases the damage reduction by a percentage. Shadow Stampede: Adjusted CD to 8s from 10s. Ghost Bursters: Adjusted Cooldown to 5.5/5.1/4.714.3/3.9/3.5 from 6/5.6/5.2/4.8/4.4/4. [Spirit Wheel] Unique Passive – Soul Steal: Adjusted Magic Attack Bonus gained from every 15 stacks to 40 from 30. Now can add at most 80 Magic Damage, instead of 60. [Soul Scroll] Unique Passive – Soul Steal: Adjusted Magic Attack Bonus gained from every 15 stacks to 40 from 30. Now can add at most 160 Magic Damage, instead of 120. [Dominance Ice] Unique Passive – Increased the applicable range of Arctic Cold by 25%. Increased EXP gained from killing high-level enemy. Ravage: Optimized the rules for Al control. Evolve: Optimized the control of Creeps. Adjusted some form attributes in the Evolve mode. The event will be available after the update. During this event, you will join Guard of Dawn with Harper to fight the Evil. Defend the Land of Dawn! Complete the tasks and win awesome rewards including the permanent hero, permanent avatar border and permanent colored skin! 2. Ranks of Survival Mode will be shown. 2. All new 1st Recharge event. It will be available after the update. A. Adjusted free Hero [Freya] for the 1st Recharge to: Players can choose one of the three Heroes: [Freya], [Hanabi] and [Valir] after the 1st Recharge. B. Hero [Freya] available in Shop. Diamond 599, Can only be purchased with diamonds. A. The reporter will only receive an email with the report result 5 minutes after the settlement of the game, and the email will record the final punishment of the reported player. B. The player who is reported will receive the email of complaint 5 minutes after the settlement of the game. 4. Updated the Mastery Code Tasks of Granger and Faramis. 5. Added Combat Response Bonus in Conquest of Dawn: responding to the combat call before each round of your region starts gives you double the bonus of your first victory rewards for that round. 6. Optimized the display logic of the red dot in Contest – Admin. 7. Optimized the vanishing speed of the red dot. 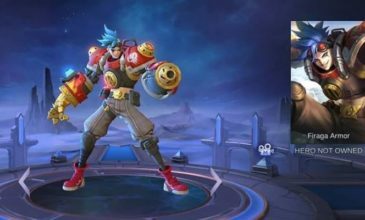 Fixed a bug where Hero Display screen did not show default skin when the only the hero is purchased. when xborg gonna be release? it’s like lol? 2 week after release on pbe serv? (or something else fixed?) or it’s just random?